I am writing on behalf of the cross-party Campaign for Clean Air in London (CCAL) to respond to the consultation on the transposition of Directive 2008/50/EC of the European Parliament and of the Council of 21 May 2008 on ambient air quality and cleaner air for Europe (the Directive) which closes on 29 January 2010. Thank you for the opportunity to do so. 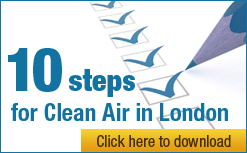 Details of CCAL’s Mission and a list of its supporters can be found at cleanair.london. CCAL supports strongly all the comments made by the ClientEarth and Environmental Protection UK in their responses to this consultation (except if in conflict with this letter in which case this letter prevails). The current consultation takes place against a background of legal action and public concern over the UK’s failure to comply with air pollution deadlines it has known about since 1999. Awareness of the scale of the public health crisis is also spreading rapidly. CCAL hereby formally brings the breach of the hourly limit value for NO2 in London to your attention, as the responsible Secretary of State, and requests and requires that you take urgent action as you are required to do to ensure full compliance with this standard. These standards have the same legal force as those for PM10 that you are also required to meet this year. The primary purpose of this letter is to respond formally to Defra’s consultation on the draft AQSR 2010 and associated Impact Assessment. CCAL has a number of detailed comments on these documents which are set out in later in this letter. However, CCAL’s general impression is that the draft AQSR 2010 have been faithfully transposed except in the most important areas where the government has failed to transpose the most essential elements and/or weakened the wording to make it ambiguous e.g. which pollutants are covered, what standards must be met, where they apply, when they must be met and what happens if a time extension is obtained. Furthermore, the draft AQSR 2010 omit completely the need for penalties that are ‘effective, proportionate and dissuasive’ if the Secretary of State fails to comply fully with his obligations. The Impact Assessment quantifies the risks of long term exposure to particulate air pollution represented by PM2.5 but then fails to accept advice from its own scientific advisory body to include in any such report a wider interval up to 15% (i.e. relative risk 1.15). In CCAL’s view, these are serious and unacceptable failings which must be addressed before the AQSR 2010 are finalised. The proposed transposition of the Directive into the draft AQSR 2010 does not yet meet the minimum requirements of the Directive. In CCAL’s considered view, Defra’s assessment of the impacts of transposing the Directive, as set out in the consultation Impact Assessment, is not thoroughly considered. CCAL has therefore provided you with additional information that it thinks must be considered i.e. herein and CCAL’s letter to the Environmental Audit Committee dated 13 December 2009 (attached) (which forms part of this submission). CCAL wishes separately to bring to your attention that the Mayor of London would put the Secretary of State in breach of his statutory duty (to ensure that the daily limit value for PM10 is not exceeded having been attained in west London) if the Mayor removes the Western Extension of the Congestion Charging Zone (WEZ) without offsetting fully adverse air quality impacts. CCAL’s analysis shows the position very clearly and confirms the situation beyond reasonable doubt. With the government and the Mayor failing in so many ways to comply with their duties to improve air quality, CCAL hereby requests and requires the government comply immediately and in full with its obligations to protect public health. Legal standards, enacted in legislation in 1999 to protect public health, are being breached widely in London. As Secretary of State you are responsible for remedying these breaches. As you know, no time extension is possible for the annual limit value for PM10 anywhere in the UK (since it was attained in 2008 (and 2009) and must not now be exceeded). The daily limit value for PM10 must be met finally in 2010 having been breached every year since 2005. The European Commission has already launched legal action over earlier breaches with the prospect of large fines. As you know, in order to protect public health, legally binding limit values were due to be met for NO2 by 1 January 2010. In CCAL’s view the: rejection by the European Commission of the UK’s application to delay compliance with the daily limit value for PM10 in London; and breach already in London – within days of the new law entering into force – of the hourly limit value for NO2, is a loud wake-up call to the government and the Mayor to improve urgently air quality and protect public health. The European Commission judged that the air quality plan for London did not even meet the ‘minimum requirements’ for a time extension for PM10. CCAL requests and requires the Secretary of State to: ensure full compliance with the limit values for PM10 in 2010 (even if London experiences a hot summer as it did in 2003 and 2006); cancel plans to reapply for a time extension to delay compliance with limit values for PM10 (on the grounds of following the Precautionary Principle); launch actions to comply immediately with the annual and hourly limit values for NO2; and ensure that annual mean NO2 does not exceed under any circumstances 60 μg/m3 in 2010 (and thereafter as would be required if the UK obtains a time extension to comply fully with NO2 limit values in London for a period up to 1 January 2015). CCAL will bring the need for these actions to the attention of Janez Potočnik, the new Environment Commissioner Designate, and urge him to intervene – once he takes office – to protect the lives of Londoners. do you consider that our assessment of the impacts of transposing the Directive, as set out in the consultation Impact Assessment, is thoroughly considered? If not, please provide any additional information that you think needs to be considered. CCAL comments and responds below on each in turn. AQSR 2010 In many areas, the Directive has been faithfully transposed in the draft AQSR 2010. However, the draft AQSR 2010 fails to transpose or transposes incorrectly the Directive where it matters most e.g. which pollutants are covered, what standards must be met, where they apply, when they must be met and what happens if a time extension is obtained. CCAL finds these systematic failings totally unacceptable. 1. Article 2 sets out “Definitions” for the purposes of the Directive. v. there are a variety of similar failings as to where and when limit values apply which are described further below. 3. Article 22 sets out “Postponement of attainment deadlines and exemption from the obligation to apply certain limit values”. In particular, this article defines the basis for Member States to seek and perhaps obtain a time extension to comply with one or more limit values and the consequences of successfully doing so. iii. requires that the Member State “shall ensure that the limit value for each pollutant is not exceeded by more than the maximum margin of tolerance specified in Annex XI for each of the pollutants concerned”. iii. failing to make clear that the limit value plus maximum margin of tolerance applies if a time extension if obtained (i.e. there is no free ride period when neither the limit value nor the limit value plus maximum MOT apply). Given that the European Commission has now rejected the UK’s application for a time extension with respect to PM10, the AQSR 2010 default position should be that the limit value must be attained in 2010. 4. Article 30 sets out “Penalties”. It requires that Member States “lay down the rules on penalties applicable to infringements”. These penalties must be “effective, proportionate and dissuasive”. However, this provision has not been transposed into the draft AQSR 2010 and the transposition note states that transposition is not required because the AQSR 2010 rely on public laws remedies in relation to breach by the Secretary of State. This is a clear failure to adopt transposition measures since public laws remedies in England and Wales are neither effective nor dissuasive. Please rectify this failure which was brought to your attention previously in respect of the AQSR 2007 by the Knightsbridge Association in a letter dated 3 January 2009.
the consultation document states in paragraph 3.44 “Where natural contributions to pollutants in ambient air can be determined and, where exceedances are due in whole or in part to these contributions, they must now be deducted when assessing compliance with the limit values”. CCAL considers Defra’s statement misleading. Paragraph 15 of the preamble to the Directive states: “Therefore, where natural contributions to pollutants in ambient air can be determined with sufficient certainty, and where exceedances are due in whole or in part to these contributions, these may, under the conditions laid down in this Directive, be subtracted when assessing compliance with air quality limit values”. As you know, CCAL believes the government’s myopic focus on cost and benefit without any apparent regard to compliance with air pollution deadlines has been a significant factor in the UK’s failure to achieve such deadlines. CCAL notes separately Defra’s reference, in paragraph 3.15 on page 9 of the consultation document, to the possibility of wider legislative changes including through primary legislation. In general CCAL welcomes such a wide ranging review and urges the government to make the changes recommended by CCAL in its letter to the Environmental Audit Committee dated 13 December 2009. In CCAL’s considered view therefore, Defra’s assessment of the impacts of transposing the Directive, as set out in the consultation Impact Assessment, is not thoroughly considered. CCAL has therefore provided you with additional information that it thinks needs to be considered (herein and attached). The picture painted by the ongoing and new legal breaches of air quality laws intended to protect public health and the government’s failure to transpose properly many of the most substantive elements of the new Directive is a damning indictment of the UK’s attitude to the protection of public health and the meeting of air pollution deadlines. CCAL therefore requests and requires the Secretary of State to remedy these failings urgently in the manner outlined above. “limit value” shall mean a level fixed on the basis of scientific knowledge, with the aim of avoiding, preventing or reducing harmful effects on human health and/or the environment as a whole, to be attained within a given period and not to be exceeded once attained. CCAL is concerned that there were substantial breaches of health based air quality laws in London in 2009. CCAL is also concerned that the government, Mayor of London and Transport for London (TfL) need to update substantially their strategic approach to improving air quality to take account of the government’s new and fundamentally different approach to air quality monitoring. From a health perspective, in 2009, annual mean NO2 in Marylebone Road, Kings Road, Cromwell Road and Brompton Road was well over double the World Health Organisation’s (WHO’s) maximum recommended level (except in King’s Road) with peak levels occurring up to 30 times more often than the WHO’s maximum recommended frequency for an hour of exposure. Full details of these monitoring sites can be found on the excellent London Air Quality Network (LAQN) (www.londonair.org.uk). Clearly, such levels of air pollution are totally unacceptable. Appendix 2 shows monitored NO2 and PM10 at Brompton Road, Cromwell Road, King’s Road and Marylebone Road from 2005 to 2009 inclusive. Air pollution in Brompton Road in 2009, for example (as a proxy for similar sites in the WEZ area), was lose to the highest levels recorded since regular monitoring began here. According to the LAQN, annual mean NO2 in 2009 was 88 micrograms per cubic metre (μg/m3) (compared to the highest recorded peak of 95 μg/m3 in 2006 and the lowest level of 83 μg/m3when regular monitoring began in 2001). Hourly maximum recommended exposure levels for NO2 were exceeded on 341 occasions in 2009 (compared with the previous peak of 518 exceedances in 2008 and (again) the lowest recorded of 97 exceedances when monitoring began in 2001). These compare with WHO standards, backed by EU and UK laws, of 40 μg/m3 and 18 exceedances respectively. You will be aware that London has the highest annual mean concentrations of NO2 of any capital city in western, or eastern, Europe. See: http://www.urbanaudit.org/rank.aspx. Appendix 1 includes links to the national air quality archive results for exceedances of all EU limit values in 2009. You will see that scores of cities and towns breached the annual mean limit value for NO2. CCAL submitted a Freedom of Information/Environmental Information request to the Mayor/TfL to ascertain what modeling of air pollutant concentrations had been done for major roads that would be affected by the removal of the WEZ. In a reply dated 20 November 2009, TfL admitted that its modeling relied upon an “estimated ‘area-wide’ traffic change factor”. Concentration modeling may be undertaken in advance of a consultation on a Variation Order. Not satisfied with TfL’s lack of analysis at that stage of the consultation process or the Greater London Authority’s stance, CCAL has undertaken its own analysis of air pollution concentrations in the WEZ area using data from the Brompton Road and Cromwell Road monitoring stations as a proxy for other local areas. This required detailed analysis since PM10 is not monitored at the Brompton Road monitoring station. As you know, no more than 35 exceedances are permitted in a calendar year. Separately, using the methodology in the Fuller and Green research paper titled ‘Evidence for increasing primary PM10 in London’ (2006), CCAL estimates that there were 46 exceedances of the daily limit value for PM10 in Brompton Road in 2008. This analysis confirms the simpler analysis above. Two points are clear from the analysis above. First, monitored levels of annual mean and daily mean PM10 in Cromwell Road were below the limit values in 2006, 2007, 2008 and 2009 having exceeded the daily limit value in 2005. Second, somewhere between the Natural History Museum and the north end of Sloane Street, the daily limit value for PM10 was [just] attained in 2009 before being exceeded by an increasing amount towards the north end of Sloane Street. CCAL estimates that the ‘cross-over’ occurred at or near the Brompton Oratory in Thurloe Place. As you will appreciate, with no breaches of attained limit values permitted, this analysis indicates that the WEZ may not be removed without – at a minimum – full offsetting measures being put in place simultaneously to protect public health (none of which seem to be planned by the Mayor). The Mayor’s draft Transport Strategy (draft MTS) includes details on the impact of the removal of the WEZ. These show that the removal of the WEZ would have significant adverse impacts on air quality. Policy 4 of the draft MTS is proposed to be implemented through Proposal 127, namely: ‘The Mayor, through TfL, subject to consultation, will remove the Western Extension of the central London Congestion Charging Zone (WEZ) after putting in place such measures in mitigation of negative impacts as are both desirable and practicable. CCAL wrote to the Mayor, copying you, in a letter dated 11 January 2010 to confirm it objects to the removal of the Western Extension of the central London Congestion Charging Zone. The Mayor’s draft Air Quality Strategy (AQS) anticipates reductions in PM10 emissions from road transport in central London by only 25-30% by 2012 from 2006 levels and 40% by 2015 and from all sources in central London by 20-25% and 30-35% respectively. The Mayor’s draft AQS anticipates reductions in emissions of oxides of nitrogen (NOx) from road transport in Greater London by only 60-65% by 2015 from 2006 levels and 35-40% by 2015 and from all sources in Greater London. Against this background, CCAL considers it unreasonable and misleading of the Mayor to have dismissed the impact of removing the WEZ by saying (in paragraph 720 of section 5.25.5 on page 251) “Possible increases in air quality pollutant emissions arising from additional traffic (which are very small in the context of London as a whole)”. Emission reductions achieved by the WEZ of 4-8% are very substantial (e.g. around one-quarter) when judged more reasonably against the total, currently planned, emission reductions in central London by 2012). Furthermore, it seems deeply flawed for the Mayor to be focusing on average London-wide impacts when some of the worst air quality in London is causing prematurely deaths within the WEZ area. In CCAL’s view, the removal of the WEZ, with the return of currently deterred traffic to the WEZ area would result inevitably in an increase – small or large – in the area of in west London breaching the daily limit value for PM10. By way of example, CCAL has provided a detailed analysis earlier in this letter of the situation in Thurloe Place, which is likely to be repeated in other parts of west London. CCAL’s carefully considered view, is that the removal of the WEZ (even in a mild, wet year never mind a hot year) would result in the daily limit value for PM10 being exceeded having been attained at or near the Brompton Oratory in Thurloe Place. Similar exceedances would be likely elsewhere in the WEZ. As you will appreciate, with no breaches of attained limit values permitted, this analysis shows that the WEZ may not be removed without – at a minimum – full offsetting measures simultaneously to protect public health (none of which seem to be planned by the Mayor). CCAL therefore requests and requires you as Secretary of State to issue legal direction(s) to the Mayor requiring him to keep the WEZ in place unless and until – at a minimum – full offsetting measures are put in place simultaneously to protect public health. If common sense prevailed, with substantial breaches of air quality laws in London, the Mayor would not even be contemplating taking ‘one or two steps backwards’ on air quality when ‘one or two bold steps forward’ are required. Mayor would need to be ‘several steps ahead’ before considering, in any way, weakening the WEZ or delaying Phase 3 of the London low emission zone. Finally, please acknowledge receipt of this letter to the email address provided separately and respond to CCAL on the main points raised in this letter. No sites in the UK exceeded the annual limit value.